A classic Los Angeles music venue was turned into a lush Moroccan-themed oasis for this spectacular Bat Mitzvah celebration, but this space and decor would have worked equally well for a Bar Mitzvah. It was a typhoon of color as far as the eye could see, with rich, red tent-like draping throughout the theater and deep yellow, orange, pink and red flowers accented by golden palm fronds springing out of the centerpieces. Multitudes of votive candles and lanterns provided a sultry, mysterious atmosphere straight out of The Arabian Nights tales. 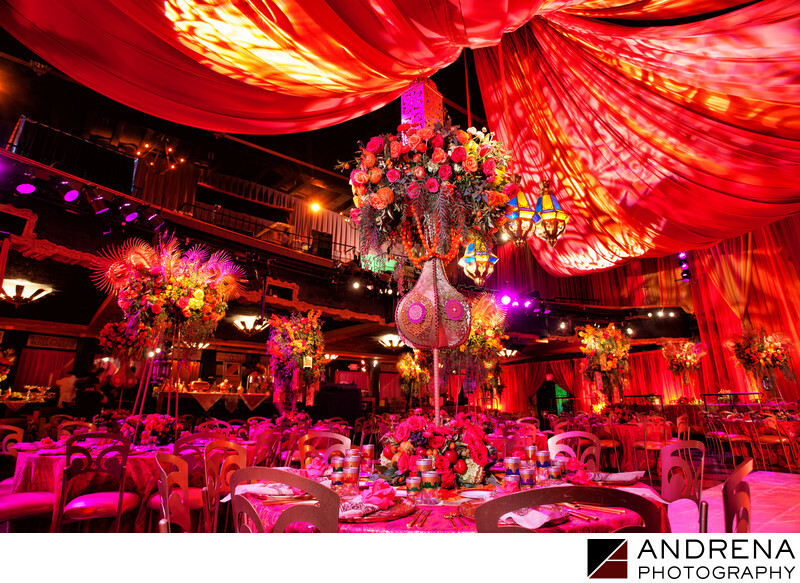 We love when a family works with floral and event designers to create an unexpected look for a Bat Mitzvah celebration.